There once was a time when I completed rooms little by little around my house. Then my husband and I found out we had a baby on the way. All of a sudden things needed to get done and FAST. So I did the nursery all at once and kept to our tight budget thanks to savvy shopping and DIY makeovers. The nursery's white base and pops of color have me dreaming of painting our next house white all over. There's no true "theme" which was the intent and we love it. We splurged on the glider and rug, saved his dresser from the curb and gave it a makeover with paint and homemade leather pulls, and had fun with the art and accent pieces. Kid's rooms are my new favorite because anything goes. Which is really how we should live in the rest of our home. Lesson learned. Live colorfully, live relaxed, live messy, just live like you. It's your house, why not? Labor Day has come and gone, so Fall is here for us Michiganders. The actual change in season may be weeks away but pools are closed and the weather is cooling off, so we're layering up and already enjoying all the pumpkin spice. With a change in temps you'll likely be spending more of your days inside. Whether it's a few details or a complete redesign, now's the time to get started and make your space feel like home. E-design services are the perfect opportunity to receive a one of a kind design on any budget, so what are you waiting for?! E-design is a virtual approach offered to give clients a professionally designed space without paying for full service interior design. All communication is done via email, which includes a customized design, space plan, shopping list, and a plan of action for pulling it all together in your home. 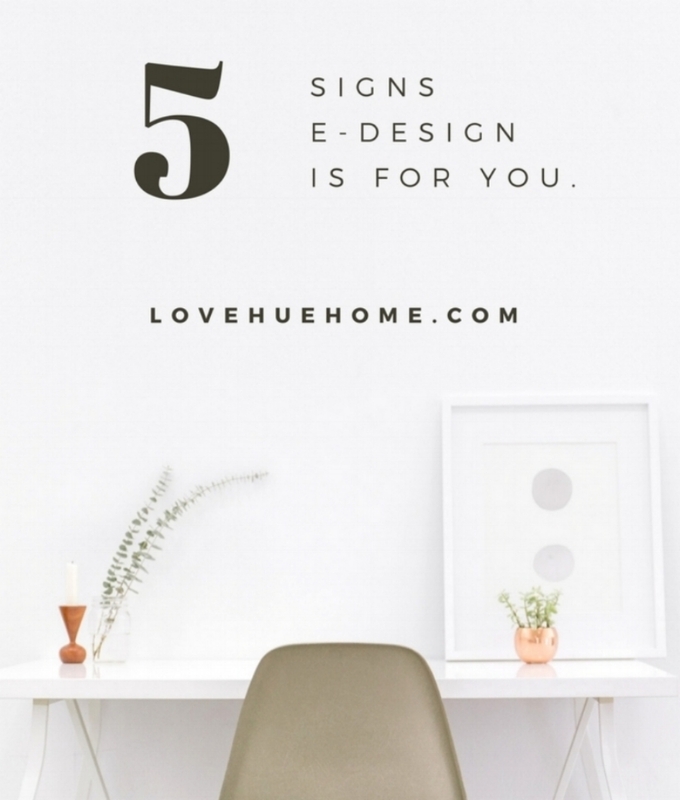 Here are five tell tale signs that e-design is right for you. 1. You want a customized space tailored to your lifestyle and budget. 2. You are comfortable measuring and taking pictures of your space. 3. You love to shop online. 4. You want the most bang for your buck. 5. You are willing to put in a little sweat equity to pull it all together at home. Whether you're right down the street or across the globe, E-design is a great option. Are you ready to start the transformation and love your home? Visit my e-design page to find out more and get started. Still not sure what is right for you? Shoot me an email and we'll figure it out together! Welcome! My name is Justine and I'm excited that you are here! Love Hue Home has been a long time coming but before we dive into design, let me tell you how I ended up with a company called Love Hue Home. No textbook definitions here, but that's life. We are all so beautifully different, in what we love, what we do, and how we live our day to day. My goal is to design gorgeous spaces that allow you to truly LIVE YOUR BEST LIFE. This looks different for everybody and that's what gets me excited about every new project. Whether you're single, married, have 5 kids, or 12 cats, you should feel happy at home. For you that may mean a styled formal space for cocktail parties or a stunning but livable space that functions as the play room, living room, and office on any given day. My point it no matter what life looks like I'm here to help. I want to help. At the end of the day, I would love for you to walk through your door and have your heart feel happy to be home.